Pharrell's "Happy" was the song of 2014, topping the charts in the U.S. and two dozen other countries, selling 6.45 million copies and winning a slew of accolades, including a Grammy Award and the inaugural Grand Clio Music Award. It was also in heavy rotation on the digital radio platform Pandora, streaming 43 million times in the first quarter alone. 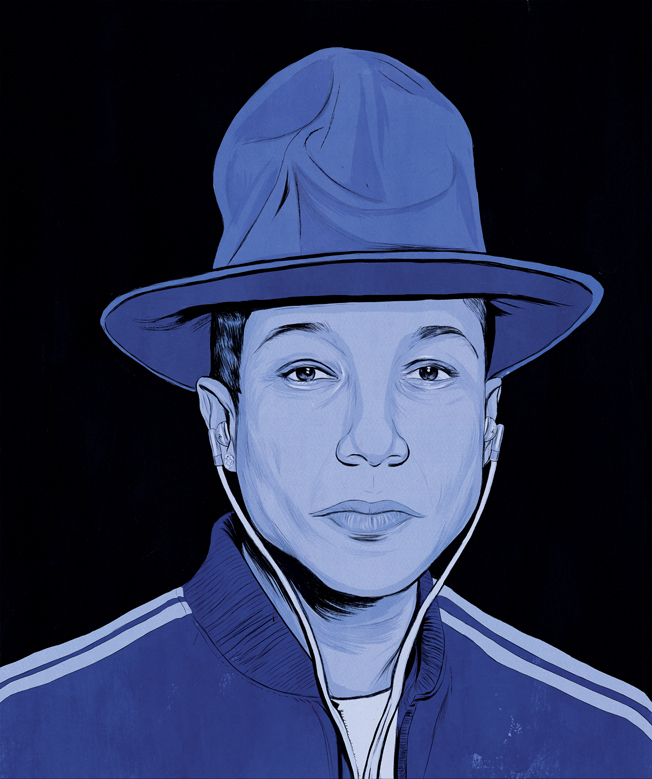 Despite all that, Sony/ATV Music Publishing says it received just $2,700 from Pandora for plays of the tune during that period, which it split with writer Pharrell Williams. "Streaming services are going to be the major method in the way music is accessed. I don't think enough money trickles down to the songwriters," says Sony/ATV CEO Marty Bandier. Streaming music was supposed to be the savior of the record business, putting the brakes on piracy while mining new ground for revenue. Meanwhile, brand marketers have viewed it as a means of connecting with the younger consumers they crave. As Nathaniel Perez, global head of social for digital agency SapientNitro, which has used Pandora's geotargeted data for its clients, points out, "Uber doesn't have the same opportunity. Sessions are short and usually about functionality. Music is interesting. It provides this opportunity for advertising to be a second screen." But streaming sites lately are facing a battle at every turn, with artists, labels, publishers and industry groups speaking out against the unfairness of their payment models. No less than America's reigning musical princess, Taylor Swift, went so far as to yank her latest album, 1989, off Spotify. The backlash has led some, including marketers who have come to rely on them, to wonder: Despite all their promise, are music streaming services in as much trouble as the record business they were meant to give new life to? Or are these merely the growing pains of an emerging medium? Pandora launched in January 2000 as a way to create customized digital radio stations based on the user's preferences. Listeners can enjoy an advertising-supported free version or Pandora One, an ad-free service that allows users to skip tracks more often, as well as other features, for $4.99 a month. The streaming platform brought in $920.8 million in revenue in 2014, a 44 percent increase year over year. Advertising alone accounted for $732.3 million of that. Then came on-demand services like Spotify, which started in 2006 as a way to combat illegal downloads, notes its chief content officer Ken Parks. Spotify's $9.99 per month, ad-free version allows users to listen to anything on any platform, and a free ad-supported option offers unlimited play on desktop and shuffle mode on mobile. Both Pandora and Spotify tout their algorithms as a way to increase discovery of new artists—a method of sampling that the record labels have come to rely on in marketing their acts. "Even if you wanted to explore the world of music from your chair, it was virtually impossible to sample genres that you had never been exposed to and records that you might have heard about but didn't have any way to access to try before you buy," Parks explains. The commodity the streaming services offer the music industry and advertisers is, of course, data. By tracking users, the services can gather valuable detail on consumer behavior. (See this week's Data Points for consumer perceptions of streaming services.) Pandora leverages that information for marketing partnerships; it also allows artists and managers to access the stats for their own use through a service called Pandora AMP. Products of the streaming services have featured some innovative tactics for marketers. Pandora Sponsored Listening, for example, lets users skip streaming ads for an hour at a time if they first watch a video ad for Sony PlayStation or Fox Television. Similarly, last September, Spotify unveiled branded video ads from Ford, McDonald's, Coca-Cola, Target, Wells Fargo and NBCUniversal, which users could view in exchange for 30 minutes of ad-free play. At this year's South by Southwest, Spotify worked with SoulCycle to appeal to fitness buffs who also enjoy the tunes heard in those trendy spin classes. As Redfoo explains, "The top of the Spotify charts doesn't just mean direct money. It's publicity you get from being known for that song. You get written about more, then your touring goes up, then you get the sponsorships." It's not that the services are trying to get away with paying through statistics, though. Streaming sites, under federal law, are required to pay royalties to both the songwriter and the performer. Radio stations, meanwhile, only have to pay songwriters. While that difference might not seem so controversial for Spotify and its on-demand model, Pandora argues that setup is unfair, considering its radio-like format. Streaming services insist that their models allow for artists who wouldn't have had their tracks played on the radio or sold albums to secure some revenue. Last December alone, Pandora facilitated a whopping 1.82 billion hours of streams. "We play about 125,000 artists in a month, and terrestrial radio plays a fraction of that," McAndrews points out. "We're not only promoting songs in general, we're promoting many songs for sales that would get no exposure. That's a tremendous amount of incremental revenue for artists." And yet, Redfoo's endorsement notwithstanding, the struggle between the streaming sites and the music business continues to rage on. On March 10, the two largest performance rights organizations (PROs), Broadcast Music Inc. (BMI) and the American Society of Composers, Authors and Publishers (ASCAP), along with reps from Pandora and other factions of the radio, broadcast and music publishing industries, began testifying before the Senate about the issue of digital music licensing. Only weeks before, BMI and Pandora faced off in federal court in New York. BMI argues that Pandora should pay 2.5 percent of its total revenue to its writer/composer/publisher members, while Pandora is fighting to keep it at 1.75 percent. "We want Pandora to succeed," says BMI CEO Mike O'Neill. "We just want it to be fair to our songwriters." The problem with streaming services, as ASCAP and BMI see it, is that by design they allow for an almost infinite number of radio stations or on-demand plays. ASCAP president and legendary songwriter and producer Paul Williams, who has worked with everyone from The Carpenters to Daft Punk in his decades-long career, points out that his organization oversaw 250 billion performances for its more than 525,000 songwriter, publisher and composer members in 2013. That number doubled to 500 billion in 2014, and he expects it to hit 1 trillion this year. While it's true the group collected record revenue in 2014—a little more than $1 billion—Williams argues that it's still less payment per spin because ASCAP gets paid as a percentage of total revenue. (Last August, ASCAP appealed a court decision that set its share at 1.85 percent of Pandora's revenue.) "How have we arrived that things are so horrifically out of balance?" Williams wonders. BMI's O'Neill faults the streaming services for using musicians' works, especially those of songwriters, to build their businesses without properly compensating the creators. Specifically, he points to Pandora, the largest user of BMI's catalog, as the principal offender. "I think the Internet will eventually have the inflection point of [terrestrial radio]," he says. "The problem is, songwriters shouldn't finance Pandora until that inflection point." Then there's Spotify, whose on-demand setup comes with its own headaches. Spotify doles out significantly more to music licensors than Pandora because it pays based on factors including number of streams on the service, meaning its payouts equate to about 70 percent of its revenue. It is also required to pay songwriters twice: The typical rate to the PROs and what is called a "streaming mechanical royalty" sent directly to publishers and songwriters. In total, the company reports, it has paid out more than $2 billion to artists, with industry estimates putting the figure at around $1.43 billion last year alone. That works out to $6,000 to $8,000 per 1 million spins. But Daryl P. Friedman, chief advocacy and industry relations officer of the National Academy of Recording Arts and Sciences (NARAS), points out that while the revenue generated from Spotify's paid subscriber base can in fact be substantial, artists receive just a portion of the still-small advertising business generated by the free model. With 45 million users out of a total 60 million not paying, he argues, the revenue from the free side simply doesn't add up to enough. Sony/ATV's Bandier notes that Taylor Swift would have kept her music on Spotify had she been able to limit it to the paid product; unfortunately, she was forced to put it on both. "The amount of money made on the free model is minimal," the exec explains. "The same applies to all of these subscription services. Free is not good. You don't write for free. You create intellectual property." Warner Bros. Records svp of sales Amy Zaret says the company is often surprised how many paid Spotify subscribers are listening to its tracks versus free users, sometimes reaching a 50-50 balance. Zaret has seen up to 3 million global streams for under-the-radar artists who would not have had the clout to get on traditional radio. And yet, free simply isn't financially viable, she argues. "Based on the free model, the payouts we're getting on streaming is so small," she says. "The problem that we're running into is Spotify is just not converting users to the paid version quick enough." Maynard James Keenan, who fronts the progressive rock bands Tool, A Perfect Circle and Puscifer, insists that he is not anti-digital music—but he admits that if he knew how little revenue he was going to get from Spotify, he probably wouldn't have checked the box to put his tracks on the service. "The only industry that remains is something that's attached to literally commercials," he says. "The main industry is gone. I'm going to make money because I can tour. I had projects that were around when there was an industry. For young, up-and-coming bands, it's a harder struggle." Fight It Out, or Ride It Out? There may be a glimmer of hope as more streaming services enter the market and greater competition emerges. Viacom music brand sales vp Paul Kelly is optimistic that once players like Apple and Google get streaming services up and running, their sheer size and distribution power will encourage (or pressure) all players to increase their payouts in order to secure deals. "As these services grow, they'll give a clearer picture of which platforms are more valuable," he explains. "Artists can be more selective about the distribution of their crafts." Then again, it could also backfire. Billboard recently reported that the record companies talked Apple out of lowering its potential subscription rate to $7.99, which the company wanted in order to compete with Spotify—and which would also have meant less revenue for Apple, and lesser payouts to the labels and artists. For now, the music industry has no choice but to ride it out—or take Keenan's route and find an alternative source of revenue in the meantime. "The wine business is doing great," boasts the musician, who owns Merkin Vineyards and Caduceus Cellars in Arizona. "You can't download my wine."